So this is a wrap type dress, which is just one of those dresses that suits practically every womans shape. Uber flattering and feminine. I remember the night my now hubby kissed me i was wearing a wrap dress… ahh sweet young love, lovely memories. With this one I just loved the navy and stripes, of course. Immediately drawn to it. Now i just need some warm weather back to wear it again. Because right now the weather is as grey as my mood.. i know, terrible. Someone needs to kick me up the arse i think. Anyway the dress is lovely and at only £34 its a real beaut: check it out here. I paired mine with my classic tan espadrille wedges and the new super gorgeous Funfair necklace, which is just fun fun fun. The colours are so bright and cheery hiding my grey mood fabulously. Do you own any wrap dresses? Do you like this style of dress? And do share, when you’re in a bad mood what do you like to do? Wrap dresses are so flattering, and yours is very pretty. That is a lovely wrap dress! I hope you feel better soon! Lovely dress and you look gorgeous. We at some point have those grey days, but then again there's always a better day or week ahead. What a perfect wrap dress! Sorry you have had a bad week- rejoice that it's the weekend and you can recharge! Such a pretty dress. I love the stripes! I don't own a wrap dress! Crazy! They always looks so classic and feminine. That hot pink lipstick looks beautiful on you! Sorry you had such a bad week, but you look great in this dress! I love the orange accessories. TFS and I hope things get better for you. Yes, I own a wrap dress, and it looks great on me. Your right…everyone looks great in a wrap dress. Sorry you've had a bad week! You look amazing though. Bad weeks are had by all, but sorry this was the week for you. It does help to look smashing in the process! There is an old Saturday Night Live skit with Billy Crystal that I always think of…"Dahling, you look mahvalous; it's better to look good than to feel good." You may not feel great today, but tomorrow is just around the corner. There's always some bad weeks so that we can really appreciate the good ones. Hang in there – it will get better! As for this beautiful dress – I am in love! I love that the stripes goes different direction because of the wrap. Sorry you're having a bad week. My week started off pretty bad too, but thankfully has looked up. I hope you're weekend will be better. However, you look amazing in the dress! I love the stripes and how you paired it with the wedges. Sorry you've had a bad week. I hope my email about the mishap with my necklace didn't tip you over! I'm wearing one of them next week – eek – I'm so itching to wear them. 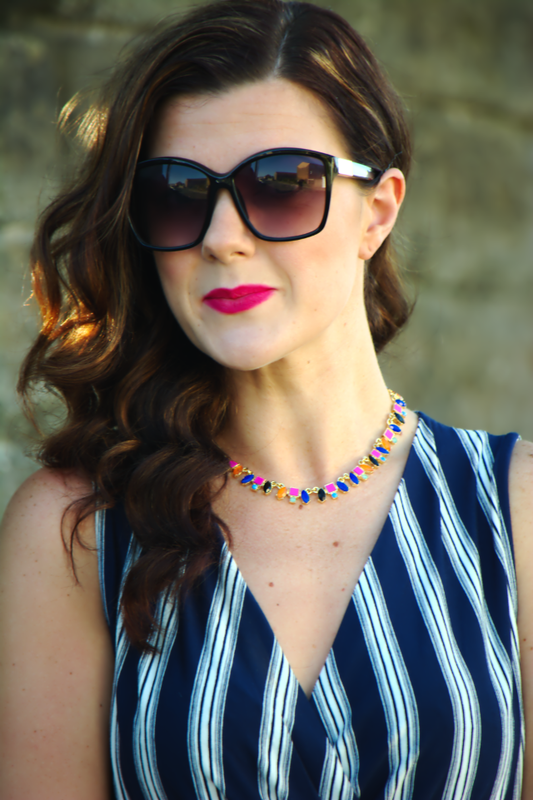 The funfair necklace looks gorgeous with the stripes and the lipstick. Lovely. Warehouse are doing some lovely dresses at the moment. I'm sorry you've had a crappy week! But at least you still look fabulous! Love the stripes and the shape of this dress. I need to get a wrap dress in my closet asap! Hope your mood's improved. You may feel crappy, but you look great! Wonderful dress on you. Thanks, too, for hosting the link up. I seriously LOVE wrap dresses and would love to get my hands on yours, which you look great it! My favourites are from DVF, bought in the sales/sample sales, but there's also a black one from Boden and a polkadot black/white from Warehouse that are in regular rotation. I love how you can wear them even though your weight/size might be fluctuating — they always seem to fit and they give you that gorgeous hourglass shape. Love your amazing outfit, you look so pretty as always!!! Find your blog so great, pretty pictures and beautiful colors.